In the 20th century in general every movie we see on TV, everything we see in newspapers or magazines is just as real as walking down the street and going to the grocery store. 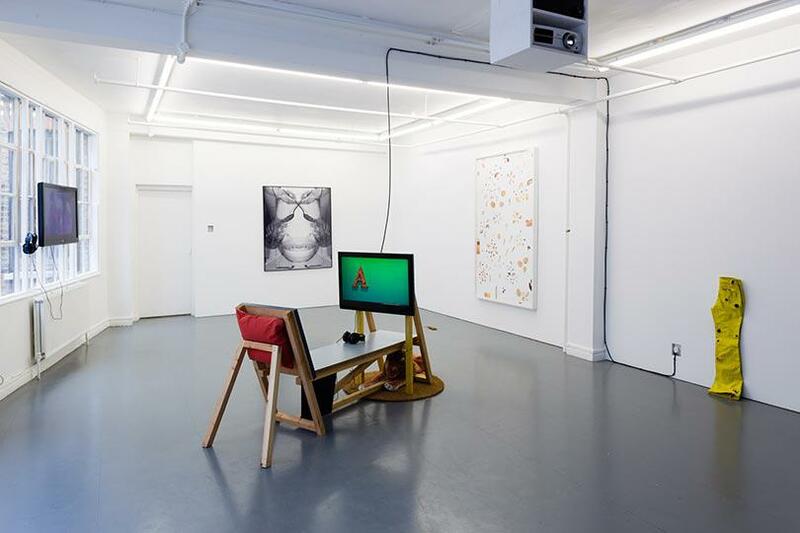 From the ‘Reverse / Repeat Series’ Baldessari’s large black and white digital print ‘Spoons, Peas and Jars, Etc.’ (2001) is shown at the rear of the gallery space. This work, not instantly recognisable as Baldessari, can be taken at face value from one side of the room: a chef preparing food, but on closer inspection the simple doubling distracts from or conceals the inedibility of the doughy looking substance occupying the mixing bowl and the darkness of the dried peas. This image acts as a starting point for the exhibition and shapes the viewer’s experience, as with each work we can look closer and find something distinctly unappetising underneath the surface. The artists shown alongside Baldessari – Andy Holden, Shana Moulton, Rachel Maclean, Heather Phillipson and Samara Scott – are informed by an understanding of how our reality is constructed and they also share Baldessari’s interest in disrupting and re-editing the everyday. Whether using products bought directly from the grocery store or unpicking the ideology behind the language of advertising the artists, through abstraction, throw into sharp relief the absurdity of how the media that surrounds us shapes our cultural desires and anxieties. The distinctive look and feel of the world of Shana Moulton’s hypochondriac alter-ego Cynthia, an enclosed pastel interior that is a crude mix of the real and digital, has in it the potential for the walls between reality and fantasy to break down, as they often do. Cynthia appears in Moulton’s on-going video series ‘Whispering Pines’ (2002’present) – an isolated character filled with melancholy, whose desperate desire for self-discovery causes her to invest in an array of New Age and wellness products. ‘Decorations of the mind II’ (2011) centres on a Magic Eye puzzle. Unable to at first unlock the hidden image, at one point her eyes travel across her face distorting into a twisted mess as they follow the instructions of her audiotape guide, she eventually manages to ‘look beyond’ the picture plane and burst through into the Magic Eye realm beyond. Rachel Maclean’s ‘Germs’ (2013) more straightforwardly subverts the language of consumerism. The video, originally made to be screened in the context of a commercial break on Channel 4 as part of their Random Acts series, begins as a straightforward advertisement before it breaks down into something stranger and far more sinister. Playing all the parts herself, Maclean variously uses products to cover her body odour with ‘Masque’ perfume, expunge free radicals from her skin with a ‘Miracle Mask’ and improve her digestion with a stomach-churning ‘Yogi-Mask’ yoghurt, before being bludgeoned to death with a spray bottle of ‘Mr Mask’s Multi Task Germ Destroyer’ wielded by a crazed human-sized bacterium. On a more surface level, Andy Holden’s ‘Make-Up Collage’ (2013) takes one part of the visual language of the cosmetic industry, the swirls and splodges of creams, liquids and lotions that appear on the pages of glossy magazine, and cuts them from their context. We see in these painterly smears the art of the cosmetics industry: liberated and rearranged into abstract patterns the gap between the realities of make-up, firstly from these confection-like representations and secondly from the promise of a more beautiful you, are made apparent. In the 21st century, as much as we are aware of the unreliability of images, and when reminded taste the bitterness of fakery, we are also products of a hyper-consumer society; our easy familiarity with the products and visual languages represented in the exhibition point to our implicit acceptance of the way in which our reality is distorted. Now fretting over the bacteria in your toilet while drinking probiotic yoghurt is more everyday than walking down the street and going to the grocery store.